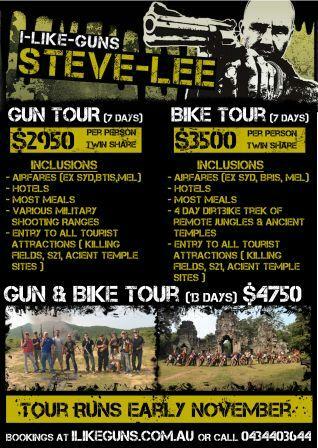 Well the I Like Guns Tour of Cambodia has been a pretty big part of my life for the last few years and the main reason being is that I have been fighting the NSW Firearms registry to get all my Australian gun Licences back. This has been a long and frustrating fight in which I have won several times but the FAR just keeps saying I cant have my licences back and have even appealed a legal decision made ordering them to give them back to me. I have fought the appeal and am now waiting for the final decision…..again. Anyway, more on that when I finally beat this unfair system. So the reason why I have been going overseas hunting, and shooting in Cambodia is because I cant shoot here at home. The gun laws have really been bad for legal gun owners. I have also attached a few videos from the last tour and I will hopefully get a few more up on my channel in the next few weeks and months. I have plenty of footage from previous trips that I need to sit down and edit but my you tube channel tends to get in the way of me living my life and always having to film everything I do gets pretty wearing after a while. Even so, I will get some footage up as I do enjoy reading peoples comments and like to entertain if possible. Thanks again for taking an interest and stopping by, if you haven’t bought one or both of my CD’s yet drop into the shop or visit itunes and get yourself a copy.